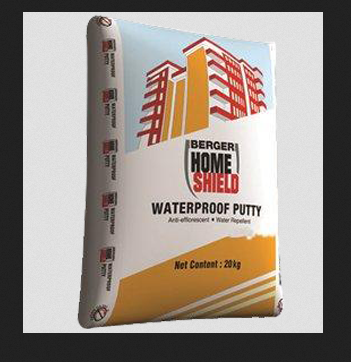 WATERPROOF PUTTY is white cement based premium quality putty with some special unique properties. This ready to use, inimitable variety powder putty can be used externally or internally on concrete/mortar substrates to provide smooth aesthetic finish & extended life of top coat paints. Cured surface provides excellent hydrophobicity, exhibiting “Lotus Bead” effect. Cured surface shows remarkably distinct anti-efflorescence effect in comparison to traditional powder putties. Seamless finish with pin holes filling capability & gives butter like smoothness. Mixed paste is light and no extra strength required for applying on wall.